The term Incomplete executions refers to the folder that Integromat uses to store data that could not be processed due to an error or could not be delivered to its final destination. The records stored in the Incomplete execution folder can be reprocessed later. Every scenario is composed of routes that consist of different modules that process data. 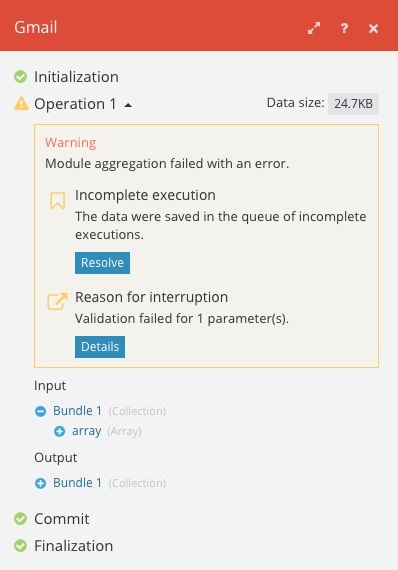 If a module encounters an error during processing, a new record is added to the Incomplete executions folder for each bundle that causes the error. It stores the state of the scenario execution from the module that encountered the error with all the prior bundles that can be referenced by that module. The record references the module where the error originated and contains information regarding what data was received by the module as input. You can handle the records stored in the Incomplete executions folder in a few ways. You can either let the data be reprocessed or you can delete certain bundles from the folder. You can also decide how you want to reprocess the data. The options you have depend on the scenario settings. To access records in the Incomplete executions folder, click the Incomplete executions button in the scenario detail or click the Resolve button in the detail of the error that initiated the record. To view a log of all operations performed during a scenario run, click the Details link in the History and then click the warning icon next to the module where the error occurred. The options influencing the creation of records in the Incomplete executions folder can be set in the Scenario setting panel. There are several categories of errors which lead to data being stored in the Incomplete executions folder. These may include: validation errors arising from incomplete or erroneous data, mostly because of a missing item that is expected in order to successfully process all data going through a module; or errors occurring from the final destination's unavailability because of temporary or long term connection failure (e.g. during connection to email or remote FTP server).